Clematis is one of the best-loved flowering vines. With thousands of varieties, it is helpful to know which basic type you have, when or if it will need pruning, and how to provide the best growing conditions. Have a look at these best tips for growing clematis. 1 Choose a variety that is suited to your growing zone. Look for varieties that thrive in your area without being wimps or thugs. Watch out for varieties known to be invasive in your area. If you are planting the clematis in a container, choose a variety that is hardy to at least one zone colder than yours. While clematis vines can tolerate partial shade, some may not flower if they do not get adequate sun. Clematis are not tough plants. When green, the stems are fragile and vulnerable to bending and breakage. This can be a big problem if you get the plant established and then decide to add trellis. Those tiny tendrils will have already wrapped themselves around whatever is available and the stems may be intertwined. Do yourself a favour and start with the trellis, get the plant in the ground, and check on your baby frequently, adding twine as needed to guide its growth. 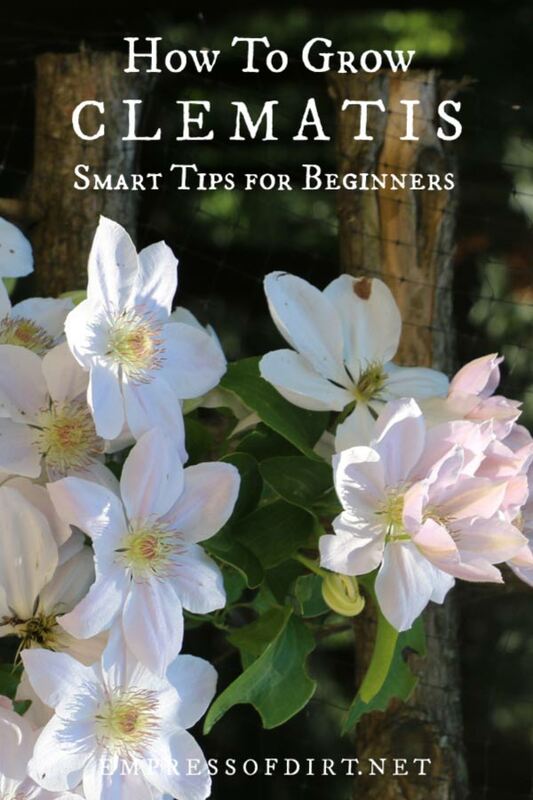 see How to Choose The Right Clematis Trellis for tips and trellis you can purchase. While some garden plants practice forgiveness, your clematis will not tolerate dry soil. Check on it daily to ensure the soil is moist, and set up an automatic watering system for super hot days or times you will be away. Instead of throwing fertilizers or other items on your soil and hoping for healthy growth, consider getting a soil test from an accredited laboratory first. The soil nutrients they test for vary, but a helpful one will look for the macro and some micro nutrients as well as the pH level and provide recommendations to amend any deficiencies. 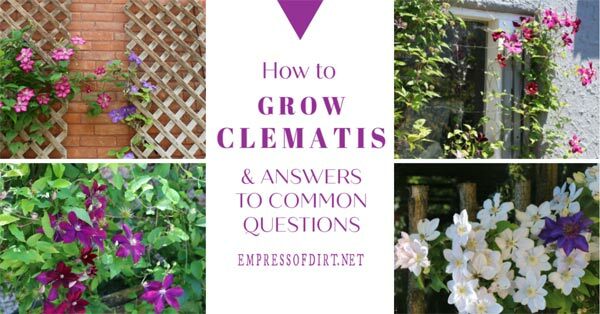 See Why Your Clematis is Not Blooming and How to Get it to Flower for information on recommended fertilizers. One of the worst problems with clematis is clematis wilt. Caused by fungi, a healthy-looking plant can wilt down to nothing within days. In addition to checking moisture levels daily, watching for wilt can save your plant’s life. The moment you notice it, it’s time to act. You can read more here: clematis diseases. You don’t need to know the name of your clematis, but you do need to know it’s pruning group. Of the three groups, there’s just one that needs a good haircut each year. See Types of Clematis and How to Identify Yours to find your pruning group. 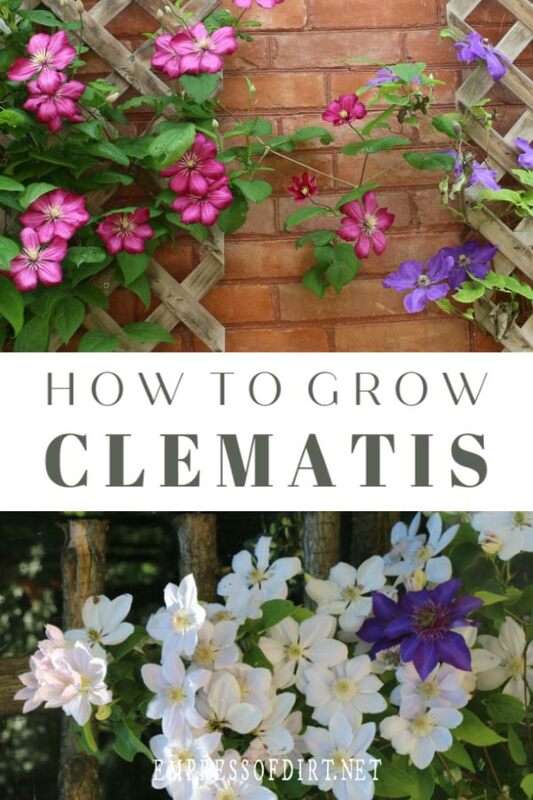 Knowing you can’t have just one clematis and they are addictive, learn how to propagate clematis cuttings so you can grow more for nothing.